We are selling these at our cost!! 21% below Adobes release price of $149.99 so we can become a volume bulk supplier. You can pay here (1 user) or click on the link above or link option to go direct to our site to view al the details and also add additional users at time of purchase for $25.00 each!!! Brand New released 3/7/2012!!! We have it 21% cheaper than Adobes $149.99 price!! Now, native video support gives photographers the capability to play, trim and extract frames from video clips shot on DSLRs, point-and-shoot cameras and smartphones. Video-specific presets and many standard Lightroom image adjustment controls can be applied to video clips, and adjusted videos can be exported as a H.264 file or published directly to Facebook or Flickr. What's New For Lightroom 4? You can now create gorgeous photo books from your images using an array of intuitive templates included in Lightroom, then upload your book for printing with a few simple clicks! Lightroom 4 provides the convenient ability to track down and group images by location, easily assign locations to images, or plot a photo journey. What's more you can automatically display this location data from GPS-enabled cameras and camera phones! Now, you can easily share video clips in high-definition format on Facebook and Flickr. Alternately, save HD clips formatted for phones, tablets, TVs, and more! Enjoy posting images to more social media and photo sharing sites like Facebook and Flickr with ease. For select sites, online comments on your images are visible within Lightroom. ImportinNow, you can bring the powerful, elegant qualities of Lightroom to all your pictures, both new and old. Import photos from other applications with ease. 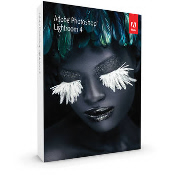 The Photoshop Lightroom 4 Software For Windows from Adobe is a complete photo management and editing suite for Mac OS X and Windows. Ideal for enthusiasts and professionals alike, Lightroom takes a nondestructive approach to photo editing, leaving the original files unmolested. All your adjustments and edits are stored in a database and applied to an image on the fly, so that you'll always be able to go back to the original image. This enables you to execute as many post-processing adjustments on a photo as you'd like, without making permanent changes to the original image.